Golden Deer Cottage is your private vacation get-away. Conveniently located just 35 miles from downtown Boston, under an hour to the seacoast and beaches, and 2 hours to scenic Kancamagus Highway in the heart of the White Mountains, it’s the perfect place to enjoy and explore New England. Located on the premier side of the lake, enjoy long afternoons of sunbathing and fun on your own lawn and private sandy beach, swimming, kayaking, SUP boarding, and fishing, followed by spectacular sunsets! And adjacent to one of the town's natural areas, there's 55 acres of hiking trails for all ages and kid-friendly rock climbing just steps from your door. Amenities include surround-sound stereo/TV, WiFi and Bluetooth, washer & dryer, south-side patio overlooking the water with large table and grill, UVA/UVB-block umbrellas, outdoor chiminea, private docks, a crystal-clear flowing artisan well, and much more! The cottage features an updated, open concept floor-plan on a true waterfront, with unique seclusion at the end of a private road. Enjoy the feeling of being in the middle of nowhere, yet just minutes away are family-friendly, affordable and award-winning restaurants, Canobie Lake Amusement Park and tax free shopping at NH's Rockingham Park Mall. Our family has owned and offered this preferred Southern New Hampshire vacation rental property since 2004. Lifelong New Englanders, we are design professionals who appreciate the lakeside lifestyle and charm of the era in which this cottage was built, yet we have updated the space with modern amenities and other enhancements that give it today's comfort and convenience. In raising our children at the lake, we understand what our guests may want or need to have an enjoyable stay here. The proof is in the kind thank-you notes that families write us in addition to their guestbook entries, the great reviews we receive year after year, and the many returning guests. Located just a short distance from the MA/NH border, the cottage is a quick 30 minute drive to Manchester and the Seacoast, and under an hour to Boston. Nearby are Malls, Golf Courses, Canobie Lake Amusement Park, SNHU Arena, Museums, Award-Winning Restaurants, Cinemas and other entertainment and shoppes. Cottage sits on a nice lot with 150 feet of private beach. Motor boats are not allowed on this lake, making swimming and boating both peaceful and inviting. The lake also has great fishing. Comfortable seating. Reclining Sofa and Loveseat. Lobster Pot, Blender, Cut board, pots, pans, Tupperware, cleaning products. SUP Board. Adult and child life vests, but personal flotation is recommended. Boogie boards, fishing gear, and toys. Golden Deer has all the comforts of home, including fresh linens and bedding, the above amenities, free WiFi and more, including: Private/on water deck w/patio furniture; UVA/B-block umbrellas; private sandy beach and upland beach; boat dock; swimming raft; BBQ-grill; lobster pot; cable/TV/DVD/Stereo surround sound entertainment system with Bluetooth; portable fans; wood stove; fireplace at water's edge w/complimentary firewood. Available (no charge): row boat, kayaks, SUP 10.5" Soft Top board. If any amenity becomes unavailable due to accidental breakages, we will do our best to replace it quickly. Beautiful property on the lake! Thanks Dyan and Gary for a lovely stay at your lakehome! This was our best vrbo experience yet. Our little family stayed at this wonderful cottage and private spot and we couldn't be more pleased; it has everything you need and it's clean and cozy. Our kids had an absolutely amazing time "hunting" bullfrogs and sun turtles, playing in the water and letting the little fish nibble at their feet, and swimming and playing in the shallow beach. In the evening we sat lakeside and enjoyed the sunsets, chiminea and made s'mores. The hosts were incredibly responsive and generous. It was hard to leave such a peaceful and fun place but we look forward to staying here again! Loved our stay at this lakeside gem! We absolutely loved, loved, loved our stay at the lake at this comfortable, clean, charming cottage, and quiet location on the dead end, just what we needed away from the city. We couldn't ask for more and this gem has so much more! There are great views from the kitchen and open-space area and a wonderful large south-facing deck that was perfect to relax on and have our meals. You can see all of the care that the owners put into the space for guests, and it really has everything you need to feel right at home, like the choice of coffee pots, surround-sound stereo and a huge library of videos, and luxury beds. We so loved the backyard, fires near the water, boats, floating dock, and incredible sunsets! Can’t forget the cranes and fish that nibble on your feet. A big thank you to our accommodating owners. We had so much fun! We loved our stay at the cottage! It’s private and quiet yet close to everything and we felt right at home with the really friendly owners and well equipped cottage. The home is perfect, comfortable, great deck, the accommodations were exactly as described. The yard and outside area with fireplace by the lake was the great way to relax and enjoy our evenings after so much fun on the lake, and the sunsets were glorious. The kids loved the paddle board and boats and fishing. We loved that it is so close to Boston. We will definitely be back. Wonderful property with lots to do! We had a wonderful time! 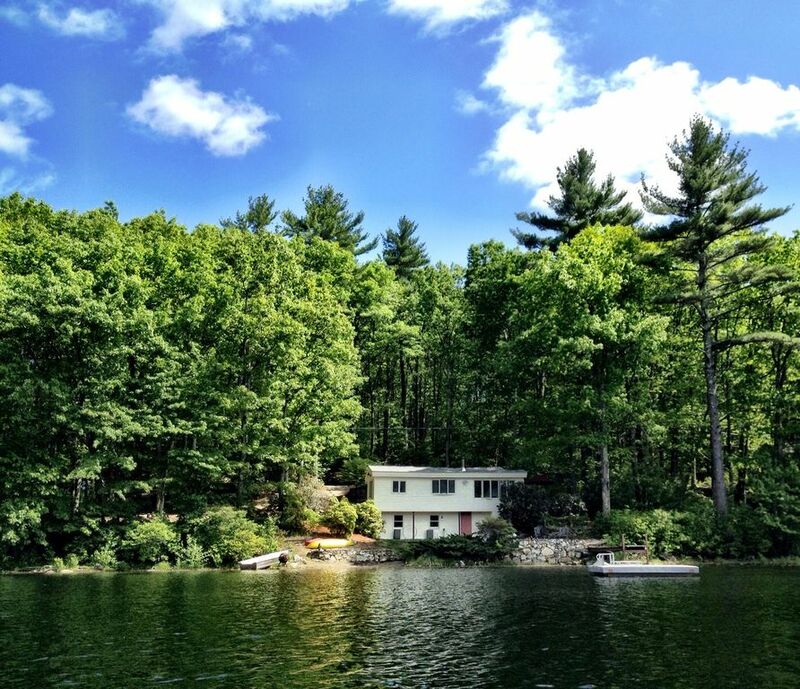 There is lots to do at the lake house... swimming, kayaking, fishing, hiking and more! My family had a great time enjoying all it has to offer. The house is extremely functional too... the kitchen has a refrigerator, stove, microwave, Keurig or traditional coffee pot and a nice island as well as table to eat at. The bathroom was simple but all you need for a lake vacation, yes the shower is small but very nice tile work. There is a washer and dryer in the basement which was great to have access to. You do have to go outside to get to it though. We enjoyed the secluded location as well as the look of the house. It is not far from stores and restaurants too. It was a wonderful vacation and we will possibly return for future visits. SPECIAL RATE ANY SEASON: As a preferred vacation rental in Southern New Hampshire for over a decade, each year we offer a 5% discount to guests staying longer than two weeks. So, visit with family or explore New England longer, and save at Golden Deer Cottage! -------------------------------------------------------------------------------------------------------- Rentals are from Saturday to Saturday. We are unable to accommodate pets. Golden Deer is a smoke-free cottage. Leaf Peeping Season: September & October - $500/2 night minimum, weekend stay.